A Real Estate Newsletter that Sets You Apart! 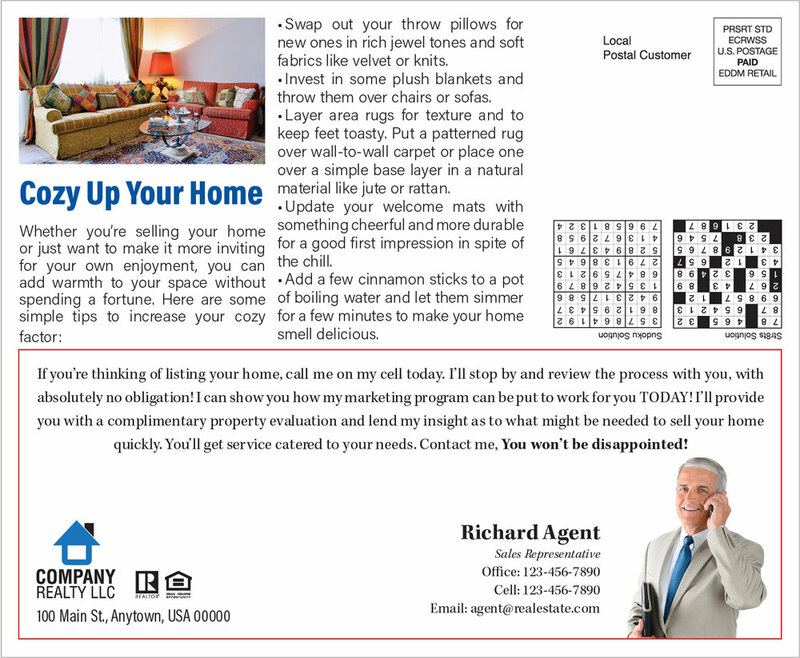 T here’s simply nothing else like it out there: An oversized, four-page real estate newsletter loaded with relevant, well-written articles, a sports schedule, word puzzles, a market update, a feature property and more, mailed economically with Every Door Direct Mail®! 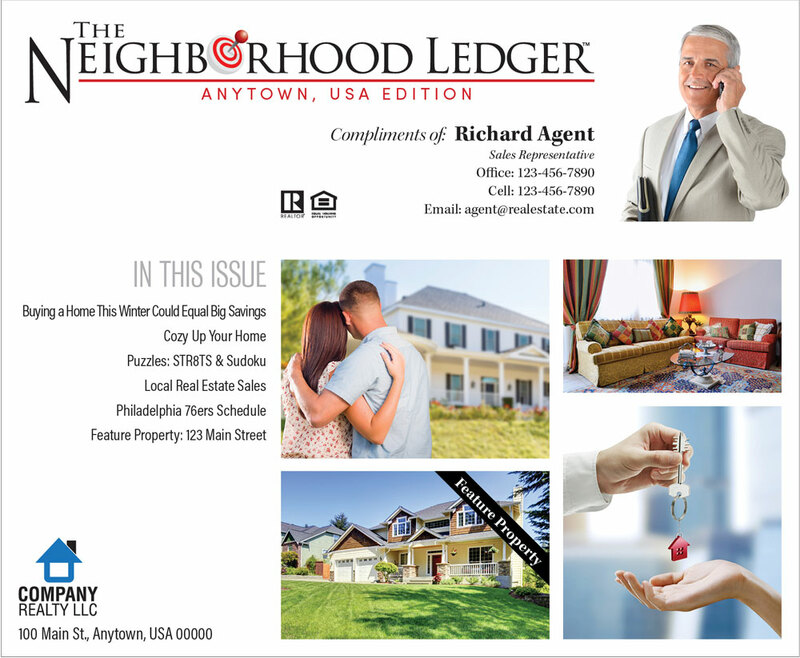 The Neighborhood Ledger™ is designed to provide your farm a real estate newsletter they can connect with. It’s filled with information that really matters to homeowners and has an interactive element so it scores high on engagement and shelf life. These are two things that directly impact response and return on investment. As an added bonus, it’s almost effortless and mails on a monthly basis with very little interaction on your part. This Real Estate Newsletter is More Than Just a Pretty Face! 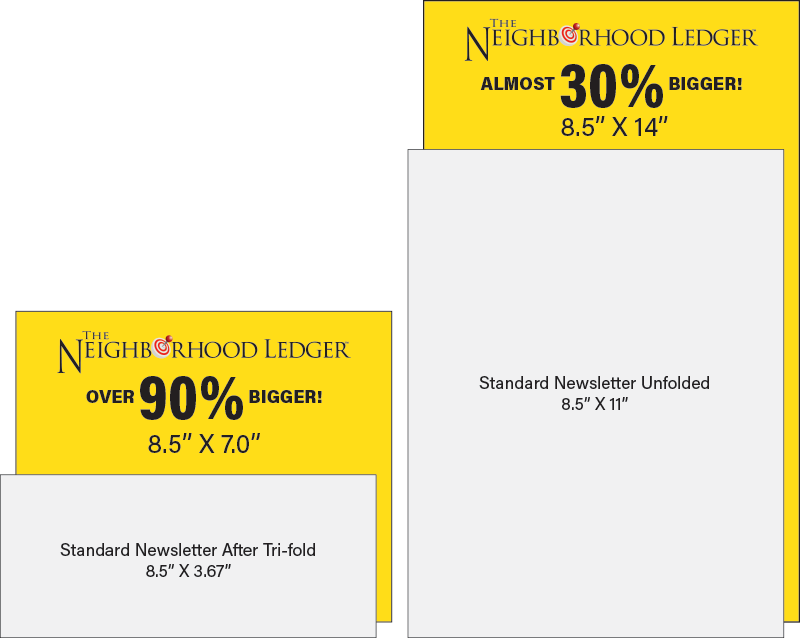 The Neighborhood Ledger™ measures a whopping 8.5” wide by 14” tall when opened. 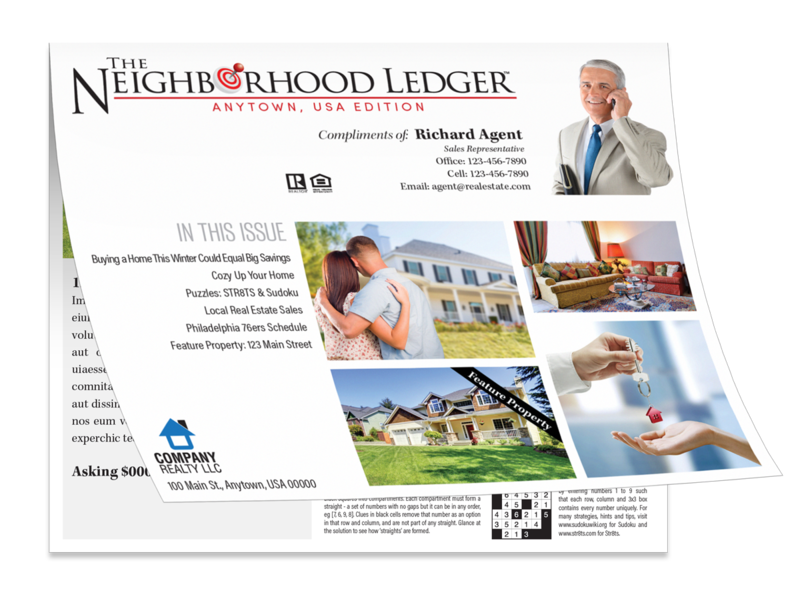 The Ledger folds and mails at a size of 8.5” by 7”, which is 90% BIGGER than the average real estate newsletter. Thanks to its larger footprint, it stands out in the mail. We print the Neighborhood Ledger™ on heavy-weight 100 lb. text stock coated with a beautiful luster lamination. It’s designed to be written on with either pen or pencil. This means it’s more likely to go on the fridge and stay there keeping your name top of mind with potential clients. Gorgeous and effective. What more could you ask for in a real estate newsletter? And, of course, just like its cousin The Neighborhood Pin™, if you’re mailing your farm on a regular basis, we won’t mail a competitor to that area with any of the Neighborhood real estate newsletter products. What makes The Neighborhood Ledger™ so special? **As longs as agent is current on mailing & payments. Can I mail The Ledger to a list of addresses? Unfortunately no. The Neighborhood Ledger is too large to go out via regular mail. We mail this marketing piece only as EDDM®. It is considered a “flat” which falls out of the regular mail footprint. If it’s critical to mail a sphere or list of names and addresses, we can do that for you as well. Simply contact us and we’ll assess your needs and provide a quote. If you want to get this going right away, the best way to get started is to go to eddm.usps.com and research your area to determine how many properties there are in the carrier route(s) you want. The map tool is easy to use, simply follow the instructions on the USPS EDDM site. You must mail the entire carrier route, no exceptions other than those residents that have requested that you “Do Not Mail” them. Use those totals you obtain from this tool to determine the total cost of mailing. The “quantity ranges are shown in the chart below. NOTE: the prices on the EDDM® Mapping Tool are postage only, and do not figure in the final pricing of The Neighborhood Ledger. You can send us an email at mike@handsfreeagent.com or fill out the contact form at the bottom of this page. We will be in touch with you within 24 hours. What is the size of The Ledger? One of the great benefits of using EDDM is the ability to use an oversized format. This Ledger is a whopping 8.5″ wide by 14″ tall and folds in half to 8.5″ wide x 7″ tall! That’s almost 30% BIGGER when open and OVER 90% BIGGER than the average newsletter when it arrives in the mail! So much more BANG for your BUCK! What content changes on The Ledger each month? What do I (the agent) need to do each month? 2. Optional; 1 feature property can be sent in a separate email from your MLS. This must be your listing or sale. If your sale, you must provide the photo. The MLS photo cannot be used by the buyer’s agent. Please note any callouts, i.e. Just Listed, Under Contract in 30 Days, etc. Will I receive The Ledger in the mail? What makes The Neighborhood Ledger so different?